The SA6000 ACOoustAlarm™ Family of SLARM™ Sound Alarms was developed in response to the increased emphasis on hearing conservation in the workplace, entertainment venues and the community at large. 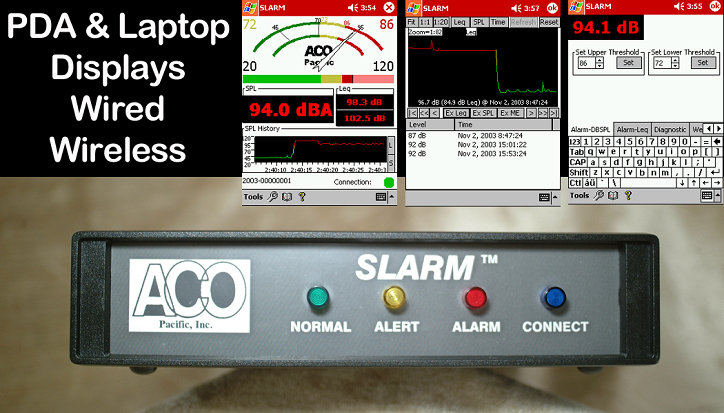 DynLeq™ and ACOoustAlert ™ technology combine to make the SLARM™ a powerful monitoring and sound level alarm system. Day-to-day applications are many - Children's Day Care Centers, Offices, Discotheques, Rehersal Halls, Auditoriums, Concert Halls, Amphitheaters, and Movie Theaters are all sources of sounds we enjoy. However, TOO MUCH and we find ourselves unable to converse, or worse - at risk of hearing damage. These locations may benefit from SPL (Sound Pressure Level) Monitoring and ACOustAlert™ Technology. Industrial environments include - Machines Shops, Stamping Mills, Assembly Lines, and other locations where noise is inevitable. OSHA and other laws govern some of this - however, continuous monitoring may not only prevent problems - but indicate them as well. A machine may generate even more noise - indicating the danger of breakdown. By monitoring their operations on an on-going basis Warehouses, Marshalling Yards, and Construction Sites can work in concert with their neighbors to improve the overall quality of life in their community. Local Law Enforcement can use ACOustAlert™ to enforce Driveby Noise Laws and other noise related ordinances. DynLeq™ is an adaptive dual Leq of the community noise level. Sound Levels exceeding the surrounding environment's average will Alert/Alarm when the Short Leq exceeds the Long Leq by a preset amount. Maximum SPL/Leq exceedence Alarms still function for individual and multiple events.